Smith Memorial Playhouse and Playground initiated their Gateway and Northwoods project in June 2016. Play finds its way into many of our projects, from the Swings at the Rail Park, which demonstrate play in an urban landscape to the play spaces at Smith Memorial, that encourage curiosity and play in nature. Most of our play projects, however, do not employ "playgrounds" in the typical sense. Rather, spaces or elements that are playful. Smith is a good example of an intensive play design that offers an alternative to artificial surfaces and brightly colored plastics, icons to what we typically consider "playgrounds." Through multiple iterations, the design team and Smith Building Committee have determined the a way to revitalize and extend Smith’s mission to the street as well as build a resource for the surrounding communities. The design suggests a “gateway” fronting Reservoir Drive that immediately invites passers-by to play. Upgrades to the lawn area in front of the historic playhouse include natural play areas that are designated for age-appropriate gross motor functions: splashing, running, climbing, building. Underpinned by a sustainable site design strategy, all the play areas are utilize natural materials. Utilitarian improvements, like safety elements and parking areas along the entry drive were determined by the site’s environmental constraints and similarly use green and natural materials appropriate for stormwater management. Conceptual perspective of the "Northwoods"
The Smith Memorial Gateway and Natural Play project design team maintains a project- dedicated website. Please check it out to learn more about the design process, community participation, and what’s to come. Something’s up at the Rail Park: It’s the Swings!!! 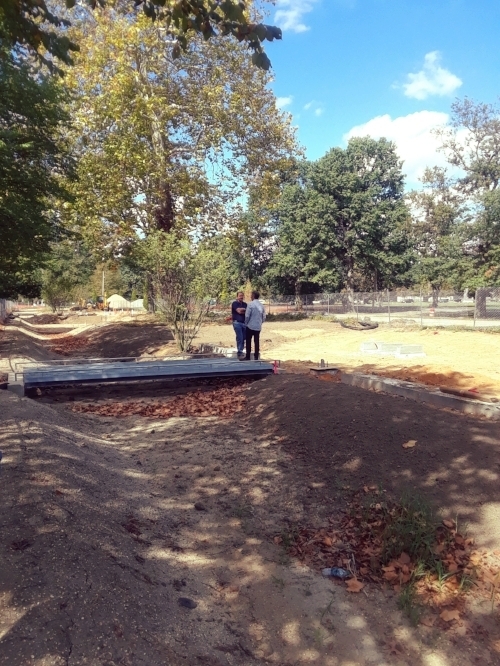 Construction of this one-of-a-kind, public open space is making headway. The contamination on the existing structure was cleaned up and the structure has been secured. The new surface has been waterproofed and poured. The big stuff is done. Now on to the fun stuff: the swings! People are talking about the soon-to-open Rail Park and recognizing the park’s potential as a transformative green space and social catalyst for many neighborhoods. In fact, just recently, AIA Philadelphia & The Trestle Inn hosted “Bryan Hanes and Inga Saffron in Conversation.” Discussion ranged from national trends in public space-making to the particulars of this project, like what is it that gets people so excited about the Rail Park? The answer is multifold, but one of the major take-aways is that people are intrigued by the scale and industrial style of this place, two elements exemplified by the swings. The recently installed swing structures are a dramatic presence on the streetscape and may be seen in the park (at the Callowhill overpass), at the street level below, and from afar. Come on by and check them out! Post photos to #therailpark! Spread the word! 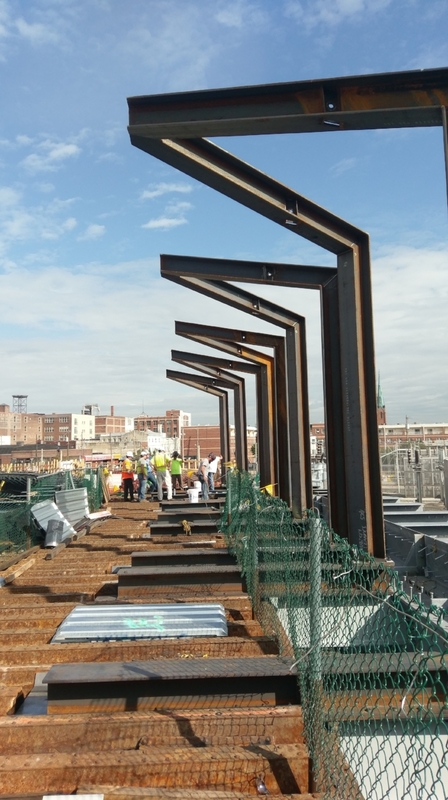 The Reading Viaduct Rail Park Phase I is Under Construction! The much anticipated Rail Park Phase I is under construction! We have been working closely with Center City District and Urban Engineers to see this transformation through. Follow our instagram account @studiobryanhanes for the most up to date images! SBH with ShiftSpace and Digsau collaborated on a response for The Mayor's Fund for Philadelphia Heart of the Community Grant Philadelphia City Hall Courtyard RFQ. Our purpose: To design an innovative, modular, multi-purpose platform for the City Hall Courtyard. Philadelphia’s City Hall is an extraordinary artificial landscape with an extraordinary history. Defined by movement and passage, the courtyard reflects the transience of our dynamic world. Our team had a blast generating our proposal! The approach encompassed three zones: the ground plane, the plane of the sky, and the zone which is occupied by visitors to the space. In the spirit of friendly competition, we congratulate Sikora Wells Appel for winning the competition! You can read about their design here and make sure to pay a visit to the pop up this summer.